It’s Friday, Aug. 28, and I’m sitting in my car, straddling the double yellow line on Avila Beach Drive, looking longingly at the stop sign I left behind on San Miguel Street. Yes, everyone. I’m that idiot. Feeling foolish at my left hook into a turn lane that doesn’t exist, cars are racing by me on the right and the left sides. Drivers are staring at me. I’m not a tourist, I swear. I was just blinded by the sun and can’t-find-a-spot-to-park rage. It built inside of me as I spent 15 minutes prowling the streets of Avila Beach, looking for something I didn’t have to pay for: a coveted street parking spot. Damn you Avila Beach Farmers’ Market, you get me every time. 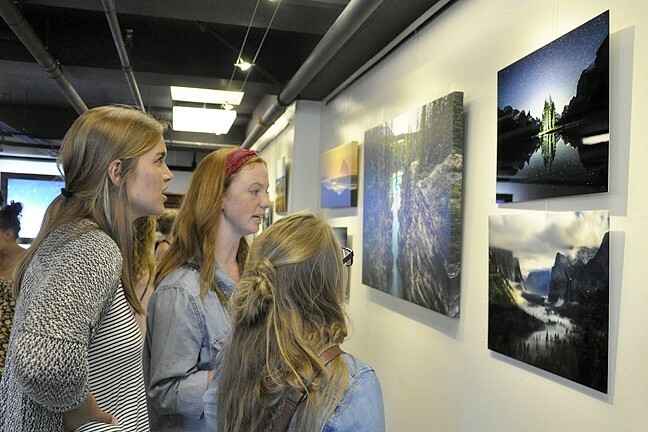 INSPIRED: Alisha Ostby, Olivia Essen, and Gigi Greene check out Burkard’s photos. Essen said before she saw his photography, she thought anyone could take a good photo. “It’s amazing, quite honestly, he’s one of the photographers that pushed me into looking deeper into photography,” she says. I pull out of my indecisiveness and illegally complete a U-turn I never meant to make in the first place. I’m giving in. Straight into that paid parking lot I go, heading directly into an empty slot. The solar-powered parking lot payment tower’s already got a customer. He’s swearing at the machine because it ate his money. At least I’m not the only one. No, it’s not farmers’ market I’m here for, although a gigantic taco of some sort will definitely complete my visit. It’s a book signing in a gallery that opened at the beginning of the summer. The Chris Burkard Gallery, opened by the local photog with a studio in Grover Beach whose stunning (yes, stunning; it’s not a word I use lightly) landscapes have made appearances for Toyota and The North Face, among other corporations wanting to be synonymous with outdoor adventure. My looking-for-parking anger is still bubbling beneath the surface as I approach the gallery. Someone nearby is munching on doughnuts. That person informs me that they’re free. 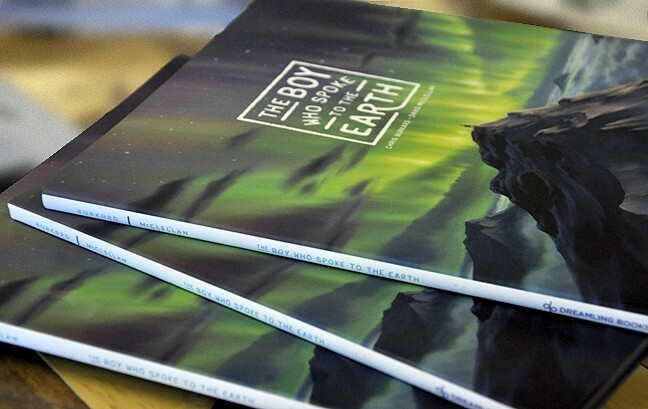 FAVORITES : In Chris Burkard’s latest book collaboration, 'The Boy Who Spoke to the Earth,' the Earth shows a little boy some of its favorite places. Free! Magic words. Suddenly, my angst melts away. I approach the Sugar Lips Mini Donuts trailer facing the gallery. “Cinnamon and sugar, powdered sugar, or both,” owner Jessica Brown asks me. She places a little paper bag in my hand, and it’s warm from the doughnuts, freshly plucked out of the fryer I can see through the window. They’re little round, sugar-dusted, toasty bites of sweet relief. Maybe I was hangry, dangerous when combined with a lack of parking spaces. Burkard did right teaming up with Sugar Lips. In my mind, the book signing is already a success and I haven’t even stepped foot in the gallery. Striding inside the sparsely furnished space, I zero in on a high-gloss image of a gorge teeming with teal-green water surrounded by a mountainscape of cliffs and pines I’d like to dive right into. I’m a little jealous of the tiny man in the red jacket standing above the rushing water on a sliver of rock. 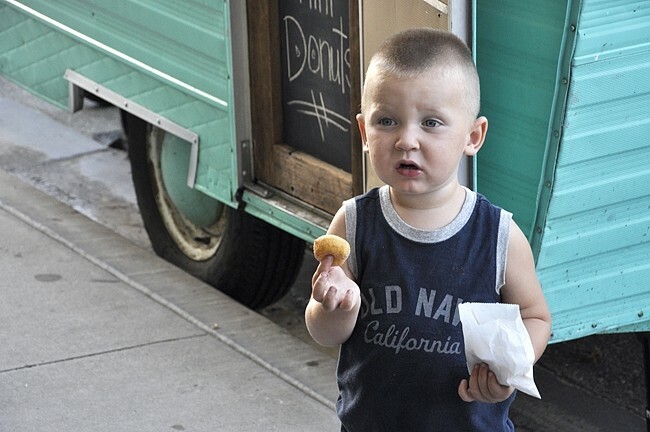 SWEET RELIEF : Chris Burkard’s nephew Isaiah, 2, gets ready to enjoy himself a Sugar Lips Mini Donut. Next to it, in the same sheen, is a starlit sky spreading its reflection over a mountain lake. A bright spot of green tent and the fire next to it lights the center of the photo and the trees above the camping spot. Yup, I’m also jealous of those guys. There’s surfer photos, sunset images, glaciers, green expanses and waterfalls—and almost every single one of Burkard’s carefully composed photos has a human element. That’s kind of his thing: Showing how the human interacts with largely unexplored, untouched parts of the Earth. 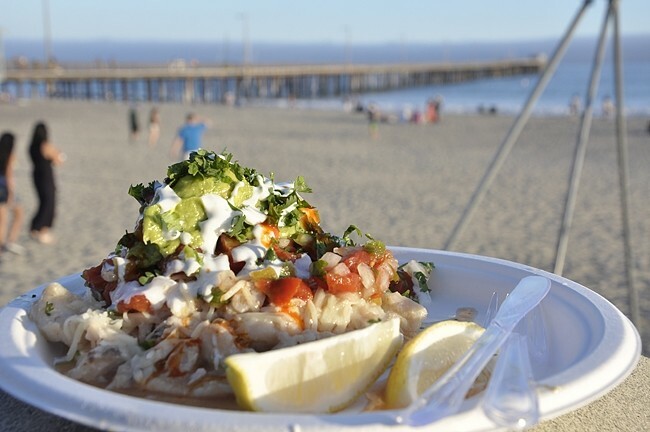 HANGER CURE: A fish taco piled high with all kinds of good stuff is synonymous with the Avila Beach Farmers’ Market. The book was funded through Kickstarter with the help of Salt Lake City-based publisher Dreamling Books. Using online social engagement, the publisher helped fund and create a buzz for the book, which Burkard says was a great experience. During the book signing, Burkard smiles constantly, interacting with visitors, friends, and kids who take photos with him. This sort of interaction and human connection is exactly why he started the gallery in the first place. At the beginning of the summer, the gallery was meant to be a pop-up space, but now it’s something Burkard wants to continue: as a spot for events, music, workshops, and showing films, among other things. For him, it hasn’t been a moneymaker, but then again, that’s not what the space in Avila is all about. EXPLORE MORE: The Chris Burkard Gallery is located at 445 1st St. in Avila Beach. For more information about Burkard’s studio, email info@chrisburkard.com or call 270-3835. Editor Camillia Lanham did find herself a farmers’ market fish taco at clanham@newtimesslo.com.